Many people imagine walking along the Champs-Élysées in Paris or strolling across the Chain Bridge in Budapest, without one very important piece of information coming to mind: walking is slow. City breaks that last a scant few days are becoming more and more common nowadays, as many people try to see all they can see of a city in 48 hours. Walking is tiring, too slow and certainly not the most efficient way to getting you between landmarks and sights. Cycle hire has become a massive thing in both Europe and America, and in many cities you can now pick up a bike for the day pretty cheaply. This not only means you’ll cover more ground but also that you’ll do it in comfort and style. Here are some tip tips on why cycling around cities make for the best trips. 1. Choose your bike carefully. Road bikes may seem the lightest and therefore the best option, but if you’re not a regular rider then you’ll find the positioning of them awkward and uncomfortable. Mountain bikes are also not ideal as they’re better suited for off-road travel. Cruisers bikes are therefore the best option as they combine comfort with practicality and provide good traction and speed for zipping around city streets. 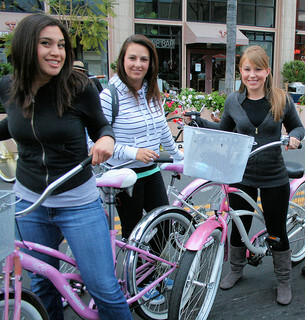 Cruiser bikes for women are also better options as they tend to be better shaped and of a better weight than the other options. Many places that hire out bikes also try to sell you some kind of tour element, usually inviting you to follow a guide around the city. This has both pros and cons: it is useful to have have directions and information given to you but it also means you can’t set your own pace. If you’re unfamiliar with a city then it may be a good idea to follow a guide, but if you’re feeling a little more adventurous then feel free to do without. 3. Take the safety of your bike seriously. If you want to leave your bike outside to visit some inside attractions, then make sure you get a lock and the appropriate tools from the point of hire. The terms usually list the loss of theft of a bike as your fault, and you’ll face a steep charge to replace the bike if it is stolen. Be smart and always lock up any bike if it is left unattended, even for a few minutes. If the weather is going to be particularly warm, ensure you drink plenty of water as cycling in the sun will often leave you dehydrated. Conversely, if you visit a cold place make sure that you’re weary of any ice or danger zones. Cycling along on your cruiser bike should be fun, not hazardous. Keep in control at all times and if the weather turns bad, just return the bike and get yourself to safety. 5. Observe the rules of the road, even when others don’t. There are many places in the world where traffic lights are seen as more of a recommendation rather than an actual rule. Therefore if you travel on roads ALWAYS be wary of cars around you. Do not trust that they will follow the rules of the road to the letter. Be observant: if you notice several cars jumping red lights for example then make note and ensure that you keep yourself safe. Sonia Meehan wrote Why Cruiser Bike Hire is The Perfect Addition to Your City Break for Cruiser Bikes. Cool bike accessories, great bikes and nice info on the blog and promoting cycling and healthy lifestyle – this is what Cruiser Bikes is all about.